OIL AND DIAMONDS AS CAUSES OF CIVIL WAR IN SUB-SAHARAN AFRICA UNDER WHAT CONDITIONS? Research for this article was generously funded by the German Research Association (Deutsche Forschungsgemeinschaft). The authors would like to thank Maria Bondes for research assistance and two anonymous reviewers for useful comments. Recent research has increasingly questioned the link between natural resources and violent conflict while stressing the importance of resource-specific context conditions under which internal conflicts become more likely. This paper engages in a systematic analysis of six of these resource-specific conditions comparing 15 African oil and diamond producing countries. Employing a Boolean logic, the results of our analysis indicate that, typically, a conflict-ridden diamond or oil producer is highly dependent on resources, its revenues are hardly spent on distributional policies and the security apparatus and, moreover, it suffers from intercommunal problems in the producing regions. Little income from resources per capita and substantial production of lootable resources in peripheral regions seem to constitute necessary conditions for civil war. Thus, our findings imply that future theoretical models and empirical strategies should integrate the full set of (resource specific) context conditions. Efforts to raise a more integrative approach combining quantitative and qualitative research designs seem particularly promising. 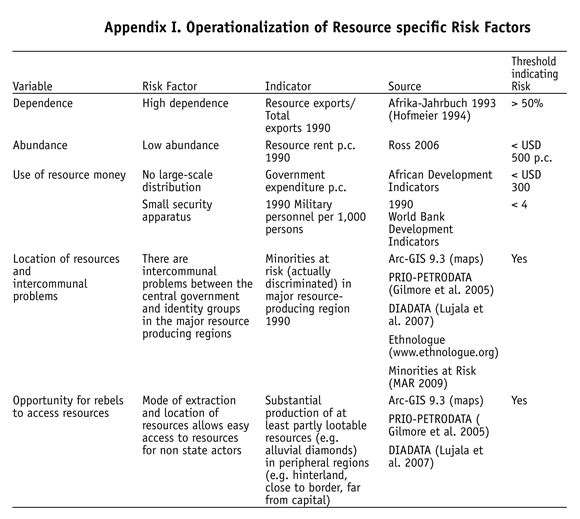 natural resources - civil war - sub-Saharan Africa - resource-specific conditions - medium N-approach. PETRÓLEO Y DIAMANTES COMO CAUSAS DE LA GUERRA CIVIL EN ÁFRICA SUBSAHARIANA ¿BAJO QUÉ CONDICIONES? Una investigación reciente ha incrementado el cuestionamiento sobre el vínculo entre los recursos naturales y el conflicto violento, haciendo énfasis en la importancia de las condiciones de contexto específicas a los recursos bajo las cuales se vuelven más probables los conflictos internos. Este trabajo se dedica a hacer un análisis sistemático de seis de estas condiciones específicas a los recursos comparando 15 países africanos productores de petróleo y diamantes. Empleando una lógica booleana, los resultados de nuestro análisis indican que, típicamente, un productor de petróleo o de diamantes agobiado por el conflicto depende altamente de los recursos, sus ingresos son poco utilizados en políticas de distribución y en el aparato de seguridad, y además, sufre de problemas entre sus comunidades en las regiones productoras. Pocos ingresos per cápita por los recursos y una producción sustancial de recursos saqueables en las regiones periféricas, parecen constituir las condiciones necesarias para una guerra civil. Por consiguiente, nuestras conclusiones implican que los modelos teóricos futuros y las estrategias empíricas deben integrar el juego completo de condiciones de contexto (específicas a los recursos). Parecen particularmente promisorios los esfuerzos para erigir un enfoque más integrador combinando diseños de investigaciones cuantitativos y cualitativos. recursos naturales - guerra civil - África Subsahariana - condiciones específicas por los recursos - medium N-approach. Recibido el 12 de junio de 2009 y aceptada el 21 de Octubre de 2009. Since the seminal work on 'greed and grievance' by Collier and Hoefer (2004; initially 1998) natural resources have enjoyed a bad reputation. They are believed to provide both motive and opportunity for violent conflict1 and to foster internal violence by their detrimental effects on institutional quality and economic development. However, the 'resource curse' paradigm has come under stress within the war and peace literature in recent years (Ron 2005). Empirically, an increasing number of studies have been unable to confirm a direct relationship between resources and internal conflict. Foremost, it may be only oil that is robustly linked to civil war onset (Ross 2004; 2006). But even the conflict-proneness of oil has been questioned or qualified in recent studies. If not a product of spurious correlations (Smith 2004; Bulte and Brunnschweiler 2008), the likelihood of civil war may depend on contextual conditions such as the amount of resource revenues and clientelistic policies that may be devised to buy out contenders or efectively suppress protest (Basedau and Lay 2009; Fjelde 2009). In general, there is good reason to believe that many context conditions and particularly resource-specific characteristics such as degrees of dependence and abundance (Basedau and Lay 2009), the mode of extraction (Luong and Weinthal 2006), the 'lootability' (Lujala et al. 2005), the location of resources (Le Billon 2001) and the quality of resource management (Basedau 2008) decide on whether or not natural resources will contribute to peace or incite violence. This paper engages in a comparative study of the role of natural resources for violent conflict in sub-Saharan Africa.2 This region is chosen for three main reasons. First, Africa is certainly the hot spot of the resource-conflict link: 'Blood diamonds' in Sierra Leone, coltan and diamonds in the Democratic Republic of the Congo (drc), oil in the Niger Delta in Nigeria and oil and diamonds in Angola have turned African countries into showcases of the 'resource curse'. Even less well-known conflict cases such as the Côte d'Ivoire (cacao, diamonds) and Niger (uranium) are apparently linked to natural resources. Second, despite the apparent high salience of 'conflict resources' and the many civil wars in Africa, a specific and systematic study of this region has been neglected in recent years, particularly with regard to a comparative study of the resource-specific conditions noted above. Finally, the bulk of African countries share several pertinent conditions such as widespread poverty, high ethnic fractionalization and being young but weak states sharing a colonial past of mostly extractive institutions. Thus, focusing on this part of the world may be particularly fruitful. Hence, this paper addresses the following research question: Do resource specific contextual conditions explain why some major resource producing countries in sub-Saharan Africa sufer from civil war while others do not? In order to address this question the paper proceeds as follows: A first section summarizes the main theoretical arguments and reviews the empirical findings of past (mostly quantitative) studies. The empirical part of the paper compares 15 oil and diamond producers in sub-Saharan Africa and takes a closer look at resource-specific context conditions and related causal mechanisms which are often difficult to capture through quantitative macro-comparative analysis. A final part sums up the findings, discusses the results and draws conclusions for future research. It was Collier and Hoefer's (2004: initially 1998) influential work on 'greed and grievance' that has stimulated a large number of subsequent studies on the link between resources and conflict. Collier and Hoefer (2004) argue that wealth in primary commodities increases the likelihood of civil war onset by providing opportunity and the related motive of 'greed' for armed rebel activity, rather than by spurring conflict-promoting grievance. These ideas have been further developed, extended and modified in the literature. 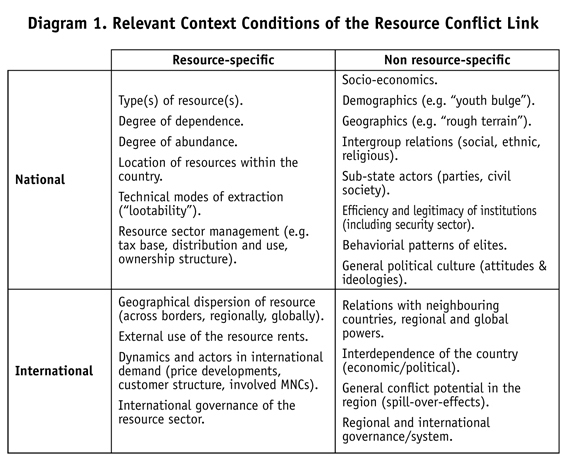 Generally, natural resources may promote violence through either motive or opportunity as well as through indirect mechanisms such as detrimental impact on institutions and socio-economic development (see also Le Billon 2008).4 Humphreys (2005) has probably provided the most inclusive compilation of six possible causal mechanisms (and several subtypes) for civil war onset.5 (1) The 'greedy rebels' mechanism is in line with Collier and Hoefer's (2004) argument and suggests that the booty character of natural resources motivates rebels to take up arms and/or continue fighting. (2) A variant of this claim suggests that 'greedy outsiders' might be ready to intervene militarily either directly or through support for internal warring factions in order to gain or maintain control over lucrative resources. (3) In contrast, the 'grievance' transmission channel suggests that perceived deprivation of producing regions and social groups or indirect negative economic consequences of resource wealth, such as the 'Dutch disease', price shocks or uneven distribution of revenues, create 'grievances' and trigger violent uprising, especially secessionism in producing regions. (4) Similarly to crime stories, civil wars do not only require a motive, but also an opportunity.The 'feasibility mechanism' refers to natural resources providing the financial means for rebellion. (5) The 'weak state' mechanism draws on the harmful effects of resource abundance on the quality of state institutions (corruption, clientelism), which in turn makes internal violent conflict more likely (see Fearon 2005; Fearon and Laitin 2003).6 (6) Finally, the 'sparse network mechanism' argues that rentier economies have a one-sided integration in the world economy and, hence, cannot develop these 'thick' terms of exchange which have been identified as conducive to peace and stability. Both dependence and abundance have different implications for the likelihood of civil war. Resource dependence may be especially violence-enhancing at higher levels. Countries are vulnerable to price shocks which, in turn, render economic crisis and (thus) conflict likelier (Basedau and Lay 2009). Moreover, resources may foster internal conflict onset only in economies with a monolithic structure that offers limited alternative income sources. Obviously, the 'grievance' and 'sparse networks' mechanism are directly related to resource dependence. In contrast, higher resource abundance per capita will probably foster peace when governments employ respective policies. Cases such as Botswana, Chile and Norway have managed their resource wealth in a fairly successful way, suggesting that the way resource wealth is distributed matters a great deal. According to rentier state theory (Mahdavy 1970; Luciani 1987; Smith 2004; Snyder and Bhavnani 2005), governments can use resource revenue for costly policies such as large scale re-distributional schemes and a huge security apparatus which are used to buy of potential dissidents or effectively suppress rebellion. As a result, rebellion will not be feasible or potential rebel leaders will find it difficult to recruit rank and file. As can be noted, these mechanisms work in the opposite direction of the mechanisms mentioned above and thus constitute a profound challenge to the resource-conflict link put forward by the conventional wisdom. Whether or not high amounts of revenue will be available does not merely depend on the output, but also on the input side of resource governance. A careful management of the resource sector will possibly include effective taxing structures (Snyder and Bhavnani 2005) and private rather than state ownership (Luong and Weinthal 2006). Inefectiveness is commonly associated to parastatals. All too often, powerful elites stuff their pockets.9 Governments also have to take care that they get a fair share of the resource revenues when co-operating with multinational companies. A recent study has found that many mnc in the resource sector have not paid taxes to African governments (osi et al. 2009). Important resource-specific conditions are not limited to domestic conditions such as the type of resource and other characteristics of resource extraction. The external structure of demand may be important. Powerful importing countries may be ready to intervene militarilyeither directly or by supporting warring factions. It was only recently that all the above conditions have come to the fore of the debate (see Humphreys 2005) and have been declared a 'key research agenda' (Collier and Hoefer 2005, 627). At this point it has to be stressed that the likelihood of conflict will also depend on non-resource-specific characteristics such as the general level of development, relations between identity groups, geographical and demographical factors, as well as the general quality of state institutions and agency of central actors. All these conditions may affect the likelihood of violence independent from resources. It is quite possible, for instance, that civil war is caused without any connection to natural resources. Hegre and Sambanis (2006) have empirically identified population size, income level and growth as well as rough terrainand not so much natural resourcesas robust correlates of major civil war. However, more importantly, resource and non-resource specific conditions are likely to interact (Ross 2008; Basedau 2005; 2008). In a resource dependent economy, wealth is mainly derived from resource income. The relations between identity groups will be affected when resources are discovered in a region that differs from the rest of the country or when the region in question does not get a fair share of the revenues but has to suffer from ecological or socio-economic stress connected to resource production. Moreover, once resource production has begun or become a realistic option, this will also affect the political economy more broadly. Yet, a robust set of favourable structural conditions and careful governance may prevent a country from lapsing into violent internal conflict. In short, 'context matters', and this applies to both resource-specific and non-resource specific conditions (see Diagram 1). A multitude of empirical studies has tried to demonstrate that natural resources increase the risk of civil war onset and duration. Given the complexity of the link and the apparent difficulty in capturing the many theoretically important resource specific conditions (see Ross 2004; Basedau 2005), it is less of a surprise that their results vary. It is fair to state that evidence on whether or not natural resources and intra-state conflict are systematically linked remains contested. Particularly, the question of howthrough which resource specific context conditions and related causal mechanismsresources impact on conflict is still under-explored. A meta-analysis of 14 econometric studies by Ross (2004) finds that primary commodities as a whole cannot be robustly linked to civil war onset and duration. According to his conclusions, the type of resource certainly matters. While no study under review by Ross can establish a relationship between agricultural commodities and violence, 'lootable' resources such as narcotics, timber and (al-luvial) diamonds do not make the onset of civil war more likely, but do seem to influence the duration of a conflict (see Lujala et al. 200510). In general, the results on 'diamond wars' are not robust (see Le Billon 2008, 352). Only oil-exporting countries seem to be particularly prone to civil war onset (see also Ross 2006), especially to secessionist uprisings such as in Angola, Indonesia and Nigeria. Further studies question the notoriety of oil: Smith (2004) finds a positive effect of oil dependence on regime stability and peace in developing countries. According to Hegre and Sambanis (2006, 531), only oil exportsnot production or other resourcesare marginally robustly linked to violent conflict. Bodea and Elbadawi (2007) confirm that oil increases the risk of civil war but other forms of violence, i.e. coup d'états and violent unrest, are not linked to natural resources. Others (Fearon 2005; Fearon and Laitin 2003) have concentrated their criticism on the greed or feasibility mechanism and propose that the oil-violence nexus works through the weak state mechanism (see Ross 2006, 290-291) or can be additionally attributed to effects of 'sparse networks' (Humphreys 2005). Contributions on the role of resources in Africa are mostly rather qualitative or focus on theoretical or methodological issues and there is a certain tendency to concentrate on policy recommendations. Besides numerous case studies that provide country-specific evidence on the resource-conflict link, there are some edited volumes and monographs that compare several pertinent cases (e.g. Basedau and Mehler 2005; Collier and Sambanis 2005; Soares de Oliveira 200712). 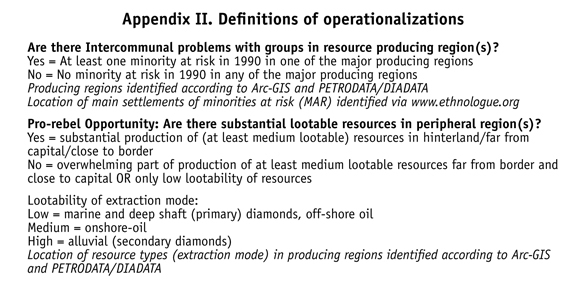 The aforementioned three case comparison of diamond producers Sierra Leone, Ghana and Guinea by Snyder and Bhavnani (2005) shows that the modes of extraction, the tax base from resource production and the patterns of spendingas suggested in the theoretical sectionmatter for the complex relationship between resources and conflict. African specific quantitative studies on the resource-conflict nexus are rare. Earlier studies have confirmed that the dependence on resources is a risk factor (Collier and Hoefer 2002; Elbadawi and Sambanis 2000). In contrast, an unpublished paper presented at the APSA annual meeting by Stanton and St. Marie (2008) finds that both renewable and non-renewable resources are weak predictors of civil war onset, while oil (negatively) influences conflict duration and the lack of renewable resources slightly increases the violence magnitude. Using a newly compiled data set on the basis of Hegre and Sambanis (2006), an unpublished paper by the authors (Basedau & Wegenast 2009) compares Africa to the rest of the world and finds that both the status of being an African country and the resource type matter for civil war onset. Dependence on primary commodities and fuels is only significantly related to conflict onset within African countries, but not in the rest of the world. High oil abundance, in contrast, reduces the propensity for civil war around the globe with the exception of Africa (where, apparently, few oil producers have the required amounts of oil income p.c.). Other resource types such as agricultural commodities, diamonds and minerals do not impact on the likelihood of internal violence outbreak in Africa and elsewhere. One study may stand out in methodological terms. Buhaug and Rød (2006) study the role of geographical factors in African civil wars from 1970 to 2001 by looking, not at nation states, but at sub-nation state units. One of their hypotheses is that the proximity to valuable resources increases the risk of civil war. However, their results are somewhat ambiguous. Proximity to oil is neither linked to secessionist nor other civil war onsets. Merely the presence of diamonds in a region makes a non-territorial civil war onset likelier (but apparently sup-presses secessionism). In sum, it can be said that systematic studies on the resource-conflict link for African countries that take the resource-specific context conditions into account are almost inexistent. In order to find out whether and which resource specific contextual conditions and related causal mechanisms have had an impact on the likelihood of the onset of civil war, we create two sub-samples of oil and diamond producers in sub-Saharan Africa. Concentrating on these two commodities does not imply that other resources do not matter. This has rather practical reasons, as a full scale test of all possibly relevant resource types is certainly a research agenda on its own and beyond the scope of this paper. Nevertheless, the choice is not arbitrary. As noted above, oil is the (only) resource type which is robustly significant in quantitative studies on civil war onset. The inclusion of African diamond producers may be particularly useful in qualitative studies of this sort. The small number of diamond producers worldwide renders quantitative studies inappropriate (Samset 2009; Le Billon 2008). Furthermore, diamond producers are relatively concentrated in Africa (60% of the world reserves). We also limit the period of investigation to the time span between 1990 and 2008. Besides having practical reasons (e.g. the availability of data), this choice can be justified by the fact that the year 1990 roughly marks the end of the Cold War that may have had specific effects on the likelihood of civil wars in sub-Saharan Africa (e.g. "proxy wars" in which the Cold War super powers supported rivals in these countries). Following Ross (2006), we include all cases in the two sub-samples of oil and diamond producers that had a non-trivial amount of production and/or potential income from oil and diamonds per capita between 1990 and 2008. For oil the threshold is used 100 per capita in at least one year between 1990 and 2008. This exercise results in a sample of eight countries including Angola, Cameroon, Chad, Congo-Brazzaville, Equatorial Guinea, Gabon, Nigeria, and Sudan. For diamond producers, valid and reliable data on the per capita resource income is less readily available. We thus decided to set a threshold of at least 0.1 carat per capita in at least one year between 1990 and 2008. The resulting sample also comprises eight countries (Botswana, Central African Republic [car], the drc, Liberia, Sierra Leone, and South Africa). Although Angola features in both sub-samples, we decided to assign it to the oil-sub sample since oil production is much more important than diamond production in the country and we intend to compare all the 15 countries. Nevertheless, the possibility that countries (to a certain amount also the drc) have several resources should be kept in mind. The comparative logic of the exercise follows the principles of Boolean algebra and is roughly similar to Qualitative Comparative Analyses (qca) procedures (Ragin 1994). Both sub-samples can be distinguished by the question of whether the countries experienced civil war or not after 1990 according to ucdp/prio data (see Gleditsch et al. 2002). In both sub-samples, three cases (Oil: Cameroon, Equatorial Guinea, Gabon/ diamonds: Botswana, Namibia, South Africa) did not experience any major episode of internal violence (dependent variable). If the resource specific conditions (independent variables) do in fact have an impact on the likelihood of the dependent variable, we must expect that they differ substantially with regard to the resource specific variables (and the related causal mechanisms) for the identified negative cases. In order to assess the theoretical ft of the conditions, we set pertinent thresholds for each variable representing a 'risk factor'. If possible, these cut-of points were set according to theoretical considerations (see Appendix i, ii and iii). It has to be conceded from the outset that this comparative design is not ideally devised to pin down causal relationships as it is not a natural experiment or a most-similar-systems design (see, for instance, Sartori 1994; Nohlen 2004). Although sub-Saharan countries usually share traits (e.g. widespread poverty, high ethnic fractionalization, being young but weak states, colonial past of mostly extractive institutions), non-resource specific conditions (or not captured resource specific conditions) may better explain the variance. However, the procedure has several advantages vis-à-vis quantitative studies. We can study all oil and diamond producers including those which are often left out by quantitative studies for various reasons. Also, individual country cases remain identifiable and it is easily possible to assess the explanatory power of individual indicators and the plausibility of causal mechanisms for individual cases. Another asset is that this procedure allows the identification of necessary and sufficient conditions. In addition, we are able to detect possible combinations of factors. The main advantage, however, is that we can have a closer look at resource-specific variables for which data is not available for quantitative studies. We also may concede that our research design remains relatively silent over non-resource specific conditions. This is partially because a full test of such conditions would certainly be beyond the scope of this contribution. However, we also tried to consider the interplay of resource-specific and non-resource specific conditions by integrating specific variables such as governance, the security apparatus, as well as data on inter-ethnic relations. Dependence may be less of a problem when it is combined with high amounts of resource income per capita. As already outlined, very oil-abundant countries are very likely to be spared from civil war onset (see Ross 2008). We measure resource abundance by the resource (i.e. oil or diamonds) rent per capita in used in 1990 according to the data provided in Ross (2006). The threshold for risky low resource abundance is set at used 400 p.c. or less. The success of the aforementioned policy options will of course depend on resource governance or, more precisely, the use of resource revenue, i.e. whether these (high) amounts are actually used for distribution and/or repression. Unfortunately, it is impossible to find data on the exact use of resource revenue; moreover, data on government expenditure on health and educationthat may proxy the distributional use of revenuesis frequently missing for African countries. The choice of indicators was hence partly dictated by the need to have at least a somewhat satisfactory data base. We thus used total current government expenditure per capita as a proxy indicator for large scale re-distributional policies (World Bank Development Indicators) with values of less than used 300 p.c. in 1990 representing a risk factor. This is a somewhat second-best indicator since it may include military spending.14 In order to have an independent measure on the size of the security apparatus, we also measured military personnel per 1,000 persons in 1990 (World Bank Development Indicators).15 Less than four military personnel per 1000 inhabitants indicate a risk. We identified the main resource producing regions and sites by using Arc-gis (version 9.3) maps and diadata (Lujala et al. 2007) and petrodata (Gilmore et al 2005) from prio as well as the main ethnic groups in these regions employing Ethnologue maps (Ethnologue: Languages of the World). We then analyzed data from the Minorities at risk project (MAR 2009) and tried to find out whether groups in the producing regions were listed as being 'minorities at risk' in 1990. The location of resources is also important for the opportunity to stage a rebellion. Two resource-specific conditions will contribute to a pro-rebellion opportunity structure and are considered a risk factor: when resources are both easily lootable in terms of their mode of extraction and their (peripheral) location within the country. In short, when it is likely that the government does not exercise full control over the resources and (potential) rebels may have easy access to them, insurgency potential increases. The resource appearance is considered as being peripheral whenever considerable amounts of resource reserves are located in areas close to the border of neighbouring countries, in the hinterland and/or far from the capital. In order to identify production sites we again used Arc-GIS (version 9.3) to create maps with prio's petrodata and diadata on production sites and then systematically assessed the location of resources vis-à-vis their peripheral character. As highly lootable we define alluvial (secondary) diamonds since little know-how and technical equipment is necessary for their exploitation. In contrast, ofshore oil, marine and deep shaft diamonds require an advanced infrastructure and are thus less lootable. Medium lootability characterizes onshore oil. Tough rebels can rarely command the infrastructure for their exploitation, they are easily able to 'tap' pipelines or kidnap contract workers from oil forms. As evident in Table 1 below, results turn out to be fairly convincing. Taking to-gether all variables and the two sub-samples, the presence of the identified risk factors allow for meaningful explanation of a civil war between 1990 and 2008. 73% of the variables are in line with our expectation ('total ft'). All individual resource specific variables (and related causal mechanisms) are able to distinguish the peaceful from the violent cases as hypothesized. Abundance per capita shows the best explanatory power with just two deviant cases (Cameroon and South Africa).17 Resource dependence, distributional policies, discriminated minorities in resource regions and the presence of lootable resources in remote regions show a ft of (almost or exactly) 75% of the variables, producing a maximum of four deviating cases each. The only less convincing risk factor or causal mechanism is a small security apparatus. Tough the majority of nine countries are in line with our expectations, there are six outliers with a total ft of only 57%. While sufficient conditions for civil war apparently do not exist for the assessed period (all peaceful cases would have to display values below the cut-of points indicating a risk), two risk factors seem to constitute a necessary condition for violent conflict. All conflict-ridden countries show abundance below the threshold and lootable resources in peripheral regions. Looking at the two sub-samples, it can be observed that the whole model works better for diamonds than for oil. For diamond countries, the total ft stands at 77% and for oil countries just at 67%. 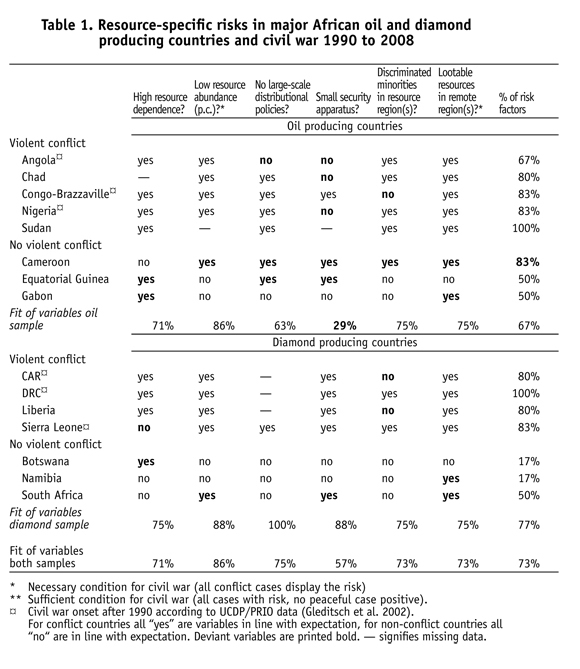 Moreover, the diamond sample shows four necessary conditions (abundance, low distribution, small security apparatus and lootable resources) and two sufficient conditions for civil war: As soon as a diamond producer lacks large-scale distributional policies18 or has discriminated minorities in the producing regions, it will definitively come to civil war. In contrast, the oil sample just produces three necessary conditions (high dependence, low abundance and peripheral lootable resources). In addition, the size of the security apparatus fails to distinguish the violent from non-violent cases as has been expected. On average, civil war-ridden oil countries have larger security forces than the peaceful ones. Regarding individual countries there is just one outlier. All nine conflict-ridden countries display at least four out of six risk factors, while, except for Cameroon, the peaceful countries show a maximum of 50% of risk factors. Sudan and the drc show the full set of risk factors and seven further violent cases have an at least 80% risk profile. Particularly, the secessionist upsurge by the various factions of the Frente de Libertação do Enclave de Cabinda (flec) in Angola's oil rich Cabinda exclave, the uprising in the Niger-Delta in Nigeria and the conflict in Sudan with the Sudanese People's Liberation Army (spla) in the oil wealthy South follow a 'secessionist logic'. There are at least medium lootable resources in remote regions which host ethnic groups in conflict with the central government. In contrast, the countries free from conflict since 1990 show different profiles. Botswana, as a peaceful country, is merely dependent on resources but otherwise free from additional risks. The 'African miracle', as Botswana has been labelled, is not only blessed with structural conditions (abundance and lack of lootable resources), but also exhibits wise governance in its spending structure and in its inter-communal relations.19 Namibia shows an equally convincing profile (although recovering from a civil war that ended in 1989). Even the presence of alluvial diamonds near the South African border does not seem a convincing risk factor when considering that this semi-desert area is sparsely populated and the diamond site has been under strict state control within the so-called 'Speergebiet' (restricted area) since being established (and also during the civil war). Other countries such as Equatorial Guinea, Gabon and South Africa show less convincing profiles with 50% of risk factors. 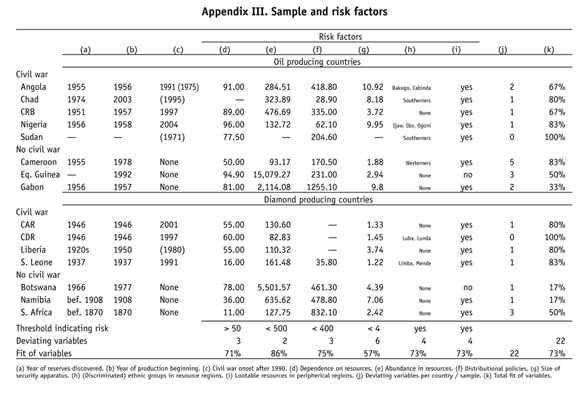 Still, these risk profiles are considerably lower than the ones exhibited by the civil war cases. Other deviations and shortcomings also deserve discussion. First, the dependent variable is the presence of civil war in general and not civil war onset. In fact, in Angola, Chad, Sudan and Liberia a civil war had started before and continued within the period of investigation (1990 to 2008). In these cases, endogeneity problems emerge. High dependence on oil in Angola, for instance, could be the result of the war that crowded out other economic sectors (Ross 2004), although this refers to the war against the União Nacional para a Independência Total de Angola (unita) since 1975 and not the onset in Cabinda with the flec rebels in 1991. Although time sequence problems also work in favour of the model, 21 strictly speaking, the risk factors in these cases can explain duration at best but not onset. Related to that, we concede that our model generally remains silent on duration and intensity. Within the sample, we have large differences with regard to the latter. Nigeria and Angola (Cabinda) are rather low-intensity conflicts, while hundred of thousands have perished in the drc, Liberia, Sierra Leone and Sudan. Second, oil production in Chad (2003), Sudan (approximately 1994) and Equatorial-Guinea (1992) began after 1990. Hence, in Sudan (first onset: 1963) and Chad (1966), oil production impacted rather on duration of civil war, unless we argue that the discovery of resource reserves changed the inter-communal relations because groups in the regions in question developed demands or grievances anticipating the revenues in the future.22 This argument, on the other hand, does not work for the other risk factors because the causal mechanisms connected to, for instance, dependence, distributional policies, security apparatus and the presence of lootable resources require actual production and not the presence of untouched reserves. A related problem refers to the fact that both the diamond and oil producers also produce other natural resources such as in Angola, drc, Namibia and South Africa. We included Angola as an oil producer but, as already mentioned, the country is also a substantial producer of (alluvial and hence lootable) diamonds. Although income from oil and diamonds in Angola does not cross the threshold indicating no risk and the additional income from other resources in Namibia and South Africa would work in favour of the model, 23 it cannot be ruled out that the drc would have crossed the threshold (though with little consequences for the ft of the country as such). If possible, future research should look at the total rents from natural resources. In general, all other resource typesparticularly non-point resources in Le Billon's senseshould be taken into account and we have to investigate the full range of possible resource-specific factors. For instance, we have neither captured structural elements of the resource sector (such as ownership or the resulting tax base) nor important aspects of the opportunity structure. Resource production facilities and transport routes are fruitful military targets and personnel can be kidnapped, as the case of Nigeria exemplifies. We also remained relatively silent over international factors. The presence of precious and strategic resources may attract external interest which might result in external military action such as in Congo-Brazzaville in 1997 and in the drc after 1998 or, alternatively, massive external support for governments. In Gabon, the French garrison came to the rescue of President Omar Bongo when his regime was threatened at the beginning of the 1990s. The most pressing challenge is certainly the inclusion of non-resource specific general contextual conditions such as historical contingencies, the role of individual actors and others. The presence of resource specific conditions and civil war may be a pure coincidence, representing a spurious relationship with no true causal connection between resources and internal conflict. In particular, the aforementioned cases with civil war onset before 1990 and late start of production show limited evidence for a direct and strong link between resources and conflict onset. Rather, in these cases, resources have contributed to the persistence of violence. Generally, however, we should not look at resource-specific and non-resource factors as mutually excluding explanations. We tried to combine resource related factors with general conditions in single variables such as the peripheral location of lootable resources, inter-communal problems in producing regions and spending from (most likely) the resource sector. Future research should proceed on this route by conceptualizing detailed causal mechanisms that integrate both types of variables and their interplay. Finally, there are issues in the more narrow methodological sense. Data is generally unreliable or simply not available with regard to many important variables such as governance and production. There will be substantial unreported production of resources and we should have ratios of production of lootable and non-lootable resources in order to assess how strong the opportunity for rebels is vis-à-vis the governments' potential for resource income. The definition of peripheral regions and substantial production of lootable resources is another challenge. We relied on systematic qualitative, but nevertheless visual and thus to some extent subjective assessment on the basis of ucdp/prio and other data; a strictly formal procedure is certainly desirable. Natural resources such as oil and diamonds are said to directly and indirectly cause violence. However, recent research has increasingly questioned a direct, deterministic link and stressed the importance of resource-specific context conditions such as the type of resource, the degree of abundance and dependence, the use of resource money, the mode of extraction and the location of resources. A medium-n analysis of 15 African oil and diamond producers allowed a closer look at six resource-specific risk factors drawn from the literature on the resource-conflict link. In sum, the absence or presence of the analyzed resource-specific risk factors can explain civil war or peace for these countries in a fairly convincing way. Nevertheless, it has to be said that the model works generally better for diamonds and there is one outlier (Cameroon). Typically, a high risk of civil war is given by a combination of an unfavorable economic and governance environment as well as conflict-ridden resource related intercommunal relations and opportunity structures. A diamond or oil producer that is plagued with civil violence is highly dependent on resources. Revenues are hardly spent on distributional policies and the security apparatus; civil war cases suffer from intercommunal problems in the resource producing regions. Little income from resources per capita and substantial production of lootable resources in peripheral regions are apparently necessary conditions for civil war. These findings set out many challenges for future research. Besides facing a number of methodological issues in the narrower sensesuch as the lack of reliable and valid datafuture studies have to take the full set of resource-specific context conditions, including the structure of the resource sector, the tax base and international influence, into account. As, for instance, suggested by Le Billon (2008), these conditions have to be integrated into more detailed causal mechanisms which should also include the interplay with non-resource specific conditions. Generally, we should also explore causal mechanisms in which natural resources play either a minor role or no role at all. Regarding research strategies, the indicators of the medium-n study should be coded for a large-n sample, though this might certainly require a time consuming and costly research effort on its own right. Also, further studies at the sub-national level are of utmost importance (e.g. Buhaug and Rød 2006). Eventually, an in-depth look at the producing regions themselves remains inevitable, ideally combined with quantitative research. In order to allow for the isolation of context conditions, in-depth small-n samples should be carefully selected including particularly diachronic and synchronic comparison within (or across) countries. It is beyond the scope of this paper to engage in extensive policy recommendations. However, one conclusion seems to be safe. Recommendations have to take into account resource-specific risks and have to be tailor-made for single cases; this requires a thorough analysis of risk profiles, most probably far beyond what could have been achieved within this modest contribution. A successful therapy requires a correct diagnosis. 1 If not indicated otherwise, conflict and violent conflict will be used interchangeably hence-forth. 2 If not indicated otherwise, Africa and sub-Saharan Africa will be used interchangeably henceforth. 3 For on overview on the literature see also Samset (2009), Basedau and Lay (2009), Ross (2008) and Le Billon (2008). 4 Le Billon has a specific terminology for this: "Resource curse" refers to the indirect effects, while "conflict resources" and "resource wars" stand for opportunity and motive respectively. 5 Humphreys (2005, 514-518) also develops a number ofpartly deviatingcausal mecha-nisms for civil war duration (see also Ross 2006, 282). 6 Though not mentioned by Humphreys nor Fearon, a weak state, particularly in remote areas, also facilitates the formation of armed rebel movements. 7 Relevant characteristics beyond 'lootability' refer to whether resource production is easily 'obstructable' by opponents and whether the trade with resources is legal (Ross 2003). 9 In Angola, Global Witness estimates that around USD 4 bn disappeared in the 'Bermuda Triangle', as the presidency is popularly called in Angola. 10 They fnd that secondary diamonds are positively linked to onset of ethnic civil wars only while primary diamonds lower the risk of both civil war onset and duration. 11 However, resource abundance is captured through an aggregate measure and oilthe most conflict-prone resourceis not separately tested as an independent variable. 12 The edited volume of Basedau and Mehler (2005) assembles eight cases (Angola, Botswana, Congo-Brazzaville, DRC, Gabon, Nigeria, Sao Tomé & Principe and Sierra Leone). In Collier and Sambanis (2005), African cases such as the Democratic Republic of Congo, Kenya, Burundi, Sudan and Nigeria are tested as to whether they are compatible with the Collier-Hoeffer Model. Soares de Oliveira (2007) discusses the role of oil on violent conflict in the Gulf of Guinea and provides valuable insights on country cases such as Angola, Chad, Equatorial Guinea and Nigeria. 13 In accordance with the principles of configurationally methodologies such as QCA, thresholds were not set arbitrarily (by, for instance, using means) but by looking for cut-off points or thresholds that best explain the distinction between violent and peaceful cases on a bivariate basis. This also allowed us to find necessary and sufficient conditions. Thus, results are sensitive to the respective thresholds. It has to be emphasized that such a procedure is not doctoring. The actual distribution of values still decides on the explanatory power of each variable. 14 However, the measures for large-scale distribution (government expenditure) and repression (size of the military) do not strongly correlate (r = 0.29). 15 Other data for resource management such as the private or public ownership of the resource sector as suggested by Luong & Weinthal (2006) or the tax base as used by Snyder and Bhavnani or Morrison (2009) were not available for all cases (or the majority respectively). 16 An unpublished article by the authors shows that the interplay of resources and ethnicity increases the risk of civil war onset. 18 For distributional policies, we concede that there is missing data for three out of four conflict ridden diamond producers. Given the poverty in CAR, DRC and Liberia at the beginning of the 1990s, however, it is very unlikely that they would cross the threshold. 19 In recent years, Survival International (SI), an international advocacy group, has accused the government of Botswana of relocating the minority group of the San in order to mine diamonds in the Central Kalahari Game Reserve (CKGR). Yet, there is little evidence supporting this claim. There has been no diamond extraction in the area up to date, and even the prospecting of diamond reserves which is currently taking place is not a convincing argument. The CKGR is the size of France and would thus have sufficient physical space to allow for both diamond production and the settlement of the some hundred of San. Rather, SI has used the notion of "conflict diamonds" in Botswana in order to raise attention for the cause of the San (Basedau and von Soest 2007: 408-412). 20 Yet, Cameroon has indeed experienced violence in the assessment period, which however was an international conflict. In 1996, the conflict with Nigeria over the Bakassi-peninsulasaid to be rich in oil and gas reservesescalated into violent conflict. 21 The high spending on the security apparatus in Angola deviates from the logic of the model but is rather a consequence of the civil war. Also, there is a minority at riskthe Lariin Congo-Brazzaville after 1990, which we did not count because it was not coded in 1990. 22 Humphreys (2005, 509) reports an interview with (1975 putschist) Wadal Abdelkadar Kamougué who denied that the newly discovered oil reserves were a motive for the coup d'état in Chad. 23 These peaceful cases are expected to show higher income from resources (also beyond oil and diamonds).